Mauricio Pochettino spoke about the rumours regarding his future yesterday as if they were as natural, impersonal and implacable as the weather. There is no point complaining about sun or rain, because it would not change anything, so there is no point worrying about speculation. You should just let it wash over you instead, part of football’s volatile climate. “There are a lot of rumours in football,” Pochettino shrugged at his press conference. If rumours are like weather, then Tottenham are caught up in a storm of them now, with Manchester United looking for a new manager for next season onwards and Pochettino top of their list. This topic dominated yesterday’s press conference, relegating the prospect of a League Cup quarter-final against Arsenal to secondary billing. These questions will not go away and this will now be a dominant theme for the second half of this season, even with Premier League and Champions League campaigns ongoing and Spurs hoping to open their new stadium soon. Of course speculation about Pochettino’s future is nothing new. As he said yesterday: “After nearly five years, a lot of rumours have happened about my position as manager of Tottenham”. This is what happens when one of the most exciting young managers in the game works for a team outside the elite. The biggest clubs are going to be interested and in the past four-and-a-half years Pochettino and Spurs have seen off plenty of speculation from elsewhere. Or, even more famously than that, when he was linked with the United job, and went out for a well-publicised lunch with Alex Ferguson before signing a new contract at Spurs. Pochettino was asked about that lunch yesterday – “Sir Alex was and is and always will be an inspiration for me” – so long has it stayed in our public memory. Or in 2017 when Barcelona announced that Luis Enrique was leaving, Pochettino was linked and initially he did not dismiss the rumours, saying that he was born “with a ball in his arms”, meaning that he understood the politics of football and how good managers get linked with big jobs. But after meeting FC Barcelona president Josep Maria Bartomeu, Pochettino clarified that it would in fact be “impossible” for him to coach Barca because of his connections with Espanyol. Barcelona eventually ended up with Ernesto Valverde. Or earlier this year when Zinedine Zidane stepped down at Real Madrid, Florentino Perez made Pochettino his first choice to replace him before realising that he could not get him out of Spurs, especially after he had signed a new five-year deal. This particular connection could turn out just like any of those. Manchester United could find someone else, or their interim manager could work out better than anyone expected. Pochettino warned that, in football, nothing is guaranteed, that things that looked like a dead cert one day could be very different the next. The weather can change quicker than people might expect, so Pochettino is not putting too much trust in it. “As always in football, no-one can guarantee anything,” Pochettino said. “We were talking a few weeks ago and I said that, if a chairman or president is going to support you, then it’s because you are going to be sacked the day after. “That job is so tough because nobody in football can guarantee you are going to be here tomorrow. In football I say, ‘Today is white, tomorrow is black’, you know? In one sense, Pochettino is right: there are plenty of things that could happen between now and the summer. Things can change quickly. But the fundamentals are unlikely to be very different: Pochettino will still be a talented manager with an impressive body of work behind him, and Manchester United will still be looking for someone with energy and ambition to come in and give them a relaunch, improving their young players who have fallen by the wayside under Mourinho. 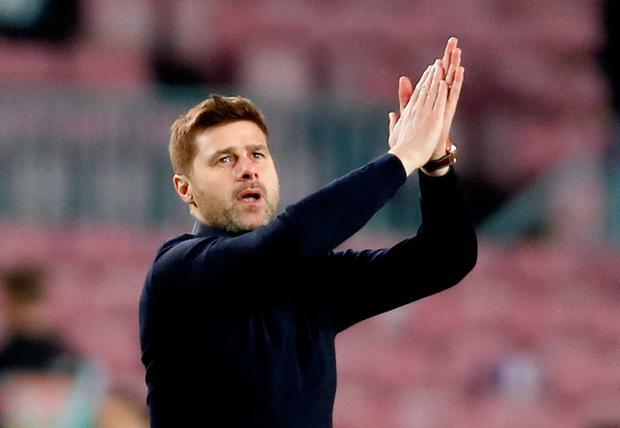 Pochettino insisted again that he is focused on his job at Spurs and he does have plenty on his plate – not least a chance to win a first trophy here, or to reach the quarter-finals of the Champions League. He said that he does not have the spare capacity to worry about United’s recruitment process, and he is surely right. “That is not my business, and I will not waste time or energy, because my focus and energy is in Tottenham. For all that, Pochettino can now expect to have United and Real fighting to take him in the summer and a number of rival chairmen and chief executives believe either club would have to pay a record fee for a manager to wrest the 46-year-old away from Levy. By the end of this season, the remaining four years of Pochettino’s contract will be worth £34m and Levy could demand a transfer fee on top of that if he so wishes. Much will depend on Pochettino’s desire and whether or not he is prepared to risk his Tottenham legacy by demanding to go. He does not have an agent and it was reported the former Espanyol manager hired a team of lawyers to study the fine print in his Southampton contract when he wanted to leave St Mary’s for Spurs four-and-a-half years ago. He could have fought his way to Chelsea in the summer if he so wished, but the Stamford Bridge project never looked quite right for him and Pochettino has always been committed to leading Tottenham into their new stadium. Despite all the delays, many believe all bets will be off in terms of what happens next for Pochettino. There can certainly be no guarantees he will ever again have the possibility of choosing between United, Real and a resurgent Tottenham.